Spit Test May Reveal Concussion Severity In Children : Shots - Health News By measuring fragments of genetic material in saliva, scientists were able to accurately predict whether a young person's concussion symptoms would last days or weeks. A saliva test allowed scientists to accurately predict how long concussion symptoms would last in children. A little spit may help predict whether a child's concussion symptoms will subside in days or persist for weeks. A test that measures fragments of genetic material in saliva was nearly 90 percent accurate in identifying children and adolescents whose symptoms persisted for at least a month, a Penn State team told the Pediatric Academic Societies Meeting in San Francisco, Calif. In contrast, a concussion survey commonly used by doctors was right less than 70 percent of the time. If the experimental test pans out, "a pediatrician could collect saliva with a swab, send it off to the lab and then be able to call the family the next day," says Steven Hicks, an assistant professor of pediatrics at Penn State Hershey. Hicks helped develop the test and consults for a company that hopes to market concussion tests. A reliable test would help overcome a major obstacle in assessing and treating concussions, which affect more than one million children and adolescents in the U.S. each year. Many of the injuries are related to sports. In most cases, concussion symptoms last only a few days. But up to 25 percent of young patients "go on to have these prolonged headaches, fatigue, nausea, and those symptoms can last sometimes one to four months," Hicks says. And, right now, there's no way to know which kids are going to have long-term problems, he says. "Parents often say that their biggest concern is, 'When is my child going to be back to normal again?' " Hicks says. "And that's something we have a very difficult time predicting." Hicks and a team of researchers have been looking for an objective test that might help. They knew that, after a concussion, injured brain cells try to heal themselves. As a part of this process, brain cells release tiny fragments of genetic material called microRNAs. Some of these fragments eventually turn up in blood and even in saliva. The team did an experiment that involved 50 concussion patients between the ages of 7 and 18. "When they came to our medical center and received the diagnosis of concussion, we evaluated them with some standard survey-based tools and then we also got a sample of their saliva," Hicks says. Most samples were collected about a week after the injury. The team measured levels of many different microRNAs in the samples, and eventually they identified a handful that let them predict how long symptoms would last. They also identified one microRNA that predicted which children would have a specific concussion symptom: difficulties with memory and problem solving, Hicks says. A saliva test could greatly improve care for young people who don't have obvious symptoms of a concussion, says Manish Bhomia, an adjunct assistant professor at the Uniformed Services University of the Health Sciences in Bethesda, Md. 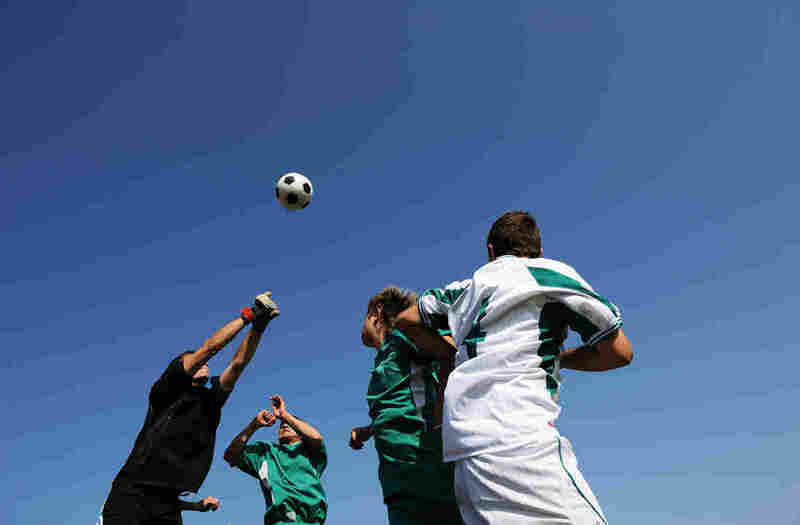 "A lot of children get mild concussion and oftentimes it goes ignored," he says. A reliable lab test would help ensure that children who have a head injury don't go back to school, or to the soccer field, before their brain has healed, Bhomia says. And microRNAs offer a promising way to assess concussions in adults as well as children, says Bhomia, whose research involves a range of "biomarkers" for traumatic brain injury. But saliva may not be the best place to measure microRNAs, Bhomia says. A better option, he says, might be blood samples, which tend to contain greater numbers of the genetic fragments.